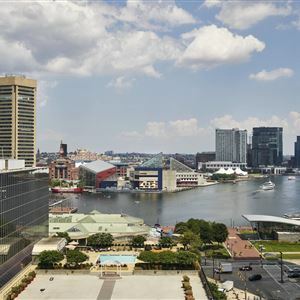 Property Location With a stay at Sheraton Inner Harbor Hotel, you'll be centrally located in Baltimore, steps from Ripley's Believe It or Not and Baltimore Convention Center. 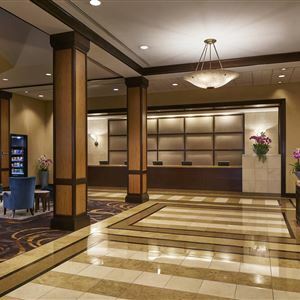 This hotel is within close proximity of Baltimore Visitor Center and Harborplace. Rooms Make yourself at home in one of the 338 air-conditioned rooms featuring flat-screen televisions. Your room comes with a pillowtop bed. Wireless Internet access (surcharge) keeps you connected, and cable programming is available for your entertainment. Bathrooms have complimentary toiletries and hair dryers. Amenities Take advantage of recreation opportunities such as a 24-hour fitness center, or other amenities including wireless Internet access (surcharge) and concierge services. Dining Grab a bite at one of the hotel's 2 restaurants, or stay in and take advantage of room service (during limited hours). Quench your thirst with your favorite drink at a bar/lounge. Full breakfasts are available for a fee. Business, Other Amenities Featured amenities include a 24-hour business center, limo/town car service, and express check-out. Event facilities at this hotel consist of conference space and meeting rooms. Self parking (subject to charges) is available onsite. With a stay at Sheraton Inner Harbor Hotel, you'll be centrally located in Baltimore, steps from Ripley's Believe It or Not and Baltimore Convention Center. This hotel is within close proximity of Baltimore Visitor Center and Harborplace. Make yourself at home in one of the 338 air-conditioned rooms featuring flat-screen televisions. Your room comes with a pillowtop bed. Wireless Internet access (surcharge) keeps you connected, and cable programming is available for your entertainment. Bathrooms have complimentary toiletries and hair dryers.